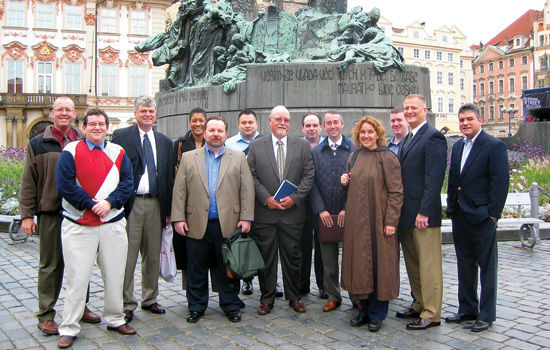 E. Philip Saunders College of Business online Executive MBA students are accompanied by Professor John Ward (third from left) and two ASL interpreters during their international trip to Prague. Five of the students completed the program in November 2010. The others finished in February 2011. A professor in the College of Liberal Arts is leading a study of under-investigated languages. Processing and Producing Head-final Structures is a new collection of writings by leading scholars, co-edited by professor Hiroko Yamashita. It is one of the first to comprehensively examine the processing and production of specific linguistic structures called “head-final structures” in different languages. Yamashita is chairman of the Department of Modern Languages and Cultures. Ann Howard, senior associate dean of the College of Liberal Arts, has been elected president of Cornell Cooperative Extension of Monroe County. In that post, she will develop research and education programming and direct local operations for the statewide service network, which is a component of the U.S. Department of Agriculture. The College of Applied Science and Technology is proud to recognize Kevin Surace ’85 (electrical engineering technology) as the 2011 Distinguished Alumnus. You may recognize Surace from a 2009 cover of Inc. magazine, which named him Entrepreneur of the Year. Surace is CEO of Serious Materials, where he leads the company’s mission to reduce energy usage of the world’s largest contributor—our buildings. He has been awarded nine patents and serves on the RIT Board of Trustees. CAST launched its electronic alumni newsletter in February. Be sure your e-mail address is accurate by reviewing your alumni profile at www.rit.edu/alumni/cast. Most alumni are familiar with Bevier Gallery, in the main lobby of Booth Hall. This gallery runs about six shows per year. From March 7 to May 7, the Graduate Thesis Exhibitions will feature work of MFA candidates for programs in the School for American Crafts, School of Art and School of Design. The SPAS Gallery, run by the School of Photographic Arts and Sciences and located on the third floor of Gannett Hall, has a few great shows to round out the academic year. Alumnus Michael Furman ’74 (photography) will show his photography featuring classic cars from March 17 to April 8. The annual SPAS Faculty Exhibition runs April 15 to May 6. Finally, the SPAS Gallery will showcase students in the 2011 Annual Student Honors Show opening May 13 and running throughout the summer. 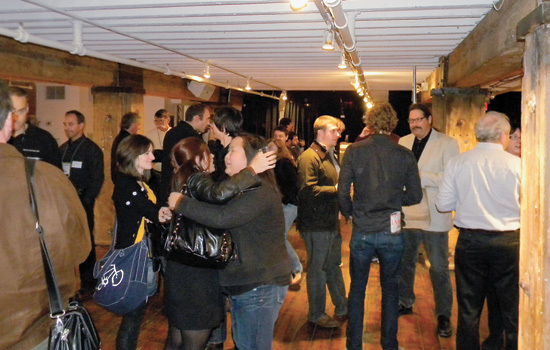 If you are looking for a place to show your work, the CIAS Dean’s Alumni Gallery is always looking for alumni artists. To learn more, contact Zerbe Sodervick at 585-475-4977. The new College of Science speaker series will feature a presentation each quarter by a graduate. Debra Kipler-Koch ’89 kicked off the series in February. She earned her master of science in chemistry and is employed as a physicist/radiation safety officer at Rochester General Hospital and is a consulting health physicist for Cardinal Health Nuclear Pharmacy Services in Rochester. Presenters for spring and fall are being scheduled now. To learn more, contact Jennifer Hinton at jennifer.hinton@rit.edu or 585-475-4283. Not only does 2011 mark the Golisano College’s 10th anniversary, but the college’s first dean, Jorge Díaz-Herrera, steps down on June 30. Stay tuned for more details on celebrations to recognize the success of the college and dean in coming months. Katie Linendoll ’05 will be honored at the 2011 Distinguished Alumni Awards celebration on April 8 for her success in leveraging her new media degree to become an Emmy award-winning TV personality and technology expert, appearing on CNN and the CBS Early Show and regularly contributing her expertise to magazines such as People, People Style Watch, Marie Claire and Shape and Fitness. The 2010-11 Kate Gleason College of Engineering Dean’s Alumni Speaker Series features several alumni, including Glenn Jackling ’85 ’90, Jeremy Gerevics ’05 and Wendi Latko ’92. This program allows students to learn about engineering concepts as applied to real-world work scenarios and to interact with graduates from their own college. Santosh Kurinec, professor of microelectronic engineering, has been named an IEEE Fellow by the Institute of Electrical and Electronics Engineers Board of Directors. The designation is one of the highest grades of membership in the international organization. Kurinec is recognized for her work integrating innovative microelectronics research into engineering education. Dwight Cooke ’09 won the top award for his research paper at the recent American Indian Science and Engineering Society Conference, held this year in Albuquerque, N.M. It was the second time his work on heat transfer for electronics cooling received the designation at the national conference. Cooke is a current graduate student in KGCOE. Alumni activities for 2011 will include introducing new president Gerard Buckley SVP ’74 ’78 (social work) to RIT/NTID alumni at various events throughout the country and inviting alumni to support NTID’s most important fundraising initiative, Imagination Hall. This new building on the east side of campus will be a one-of-a-kind, state-of-the-art facility where innovation, entrepreneurship and original research among deaf and hard-of-hearing students at the associate degree level will be fostered. Imagination Hall is expected to open in 2013. For details, go to www.rit.edu/ntid/imaginationhall. Three committee-driven events, two golf tournaments and a community picnic are currently planned to support the creation of Imagination Hall. The Saunders College of Business is thrilled to welcome its newest graduates to the RIT alumni community. The first class of the Saunders online Executive MBA program graduated at the end of fall quarter 2010, followed by the second class in winter. With more than 50 students currently enrolled, the Saunders online Executive MBA program is ideal for creative, innovative individuals who have gained their experience in the workforce, not just the classroom. For professionals living beyond the Rochester area, the interactive online component provides the flexibility to get an RIT education outside the conventional classroom framework. A new group of students enters the program every quarter, making it easy to start a degree at any point throughout the year. Go to http://embaonline.rit.edu/alumni or e-mail Kristi Dempski at kdempski@ saunders.rit.edu for more information.